Late last week, India's Union Cabinet approved the launch of a satellite to study the atmosphere of Mars. The estimated cost of the mission will be Rs. 450 crore, and chances are that the real cost will be much higher. ISRO's ex-chief, Padma Vibushan Madhavan Nair believes that such a mission to Mars might not really achieve something. Apart from him, quite a few voices in India feel that the money could be spent in a more useful way. Others, a second and a larger group, have applauded the initiative by ISRO, and are looking forward to the November 2013 launch with eagerness. Money spent on scientific pursuits, they argue, always pay rich dividends. Rs.450 Crore, they calculate, is roughly 40% of the money lost in the 2G scam. Even if the money is not spent in research, they reason, it is highly probable that the money would land up in another corrupt minister's personal account. And after all, they assure us, the pursuit of knowledge must be one's ultimate aim in life. If you tentatively ask them what if the mission failed, they would probably quote the names of numerous great minds, who crossed the hurdle of fear of failure, and ultimately led humankind to significant truths. What if real truth is undesirable? Is suffering, like Nihilists and a few others claim, the real purpose of life? Even otherwise, if there are times in a Man's life when he suffers, is he morally bound to face it, or is it permissible for him to attempt an escape into an alternate reality? What if real truth is unpercievable? What if the real truths are beyond us? What if certain things are not meant to be understood? How important is pursuit of knowledge? Are all spheres of knowledge equally important? For the first set of queries, I have listed a few situations from popular movies where truth is indeed undesirable. A strange title, one would say, in a post that is supposed to touch upon the the possibility that life has no intrinsic meaning or value. 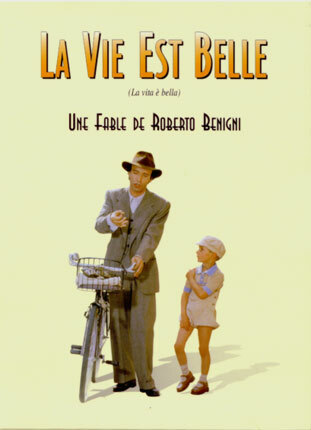 But, I am trying to draw your attention to the wonderful movie with the same name directed by Robert Benigni. In an unlikely case that you haven't seen this movie, I advise you to see it as soon as possible. Here is the plot of the movie in short : Guido Orefice (Robert Benigni) is an Italian Jew blessed with immense wit and humour. He charms a schoolteacher, Dora, and they both get married. Leading a perfectly happy life, they proudly watch their son - Giosue - grow into a 5-year old, until they face the horrific political situation around them. They are arrested by Nazis for being Jews, and sent to a concentration camp. Orefice makes his son believe that they are on a holiday, playing a complicated game. He takes immense risks to convince his son that they have a good chance of winning the game, if only the boy follows a certain set of "rules". Throughout their time at the concentration camp, Orefice suffers, but protects his son from the brutal truth. The movie ends with a grown up Giosue (who narrates the whole story in flashback) saying "This is my story. This is the sacrifice my father made. This is his gift to me." I have talked to quite a few people about the movie, and they unanimously agree with me that it is one the the best movies ever. But, just extending the story a little bit, I wonder how the son must have felt growing up. Would he be eternally grateful to his father for not letting him suffer, or would he feel guilty for living a life of a lie, for being immersed in his own imagination when the most horrific crime in humanity was being committed, for being happy when his father suffered. The son would even be justified in feeling a little angry at his father for not trusting him to handle the truth, for betraying him. What do you think? Was the father right in constructing an elaborate alternate reality just to protect his son's mind? Is truth, at least at times, so undesirable? "Sometimes the truth isn't good enough, sometimes people deserve more"
For a movie-maker, it is extremely difficult to get the approvals of both the popular public and the hard-to-satisfy movie critics. Cristopher Nolan has undoubtedly achieved this symbol of greatness. But how realistic are Cristopher Nolan's movies? Read this wonderful profile of the director to know more about Cristopher Nolan's own brand of escapism. Escapism is roughly defined as the avoidance of reality by absorption of mind in entertainment or other imaginary situations, and an escape from the banalities and unpleasantness of everyday life. The wonderful article explains Nolan's moviemaking with enough examples, but I would like talk about a scene from Dark Knight Rises (No spoilers. Nothing you couldn't make out from the trailers anyway). Gotham is under a bomb threat, and it seems like nothing can save them. Detective Blake tries to lead a bus full of children out of the city, but he is stopped. Still stranded inside the city, and noticing that the there are only a few seconds before the bomb will explode, he urges all the children to get inside the bus. The bus driver, already reconciled with his perceived fate, asks (Sorry if the quotes are inaccurate, I am repeating it from my unreliable memory) "Seriously? Do you think the bus will protect them from the explosion?". Blake replies with a question of his own "Would you let them all die without even a hope for survival?". Would you? Is hope so important that truth can take a backseat? I would say not always, but at least at times. An over-used, but true description that suits most movies is that they are a "willing suspension of disbelief". If truth is extremely important, why are so many popular movies escapist? Whenever I hear this quote, I am invariably reminded of The Matrix, and the character of Cypher. Cypher is the character who strikes a deal with The Agents -he would lay a trap for Morpheus in return for being sent back to The Matrix as a rich and powerful man, with no memories of the "truth". Cypher is a perfect example that there are quite a few people who would like to escape reality, if it is full of suffering. As you can see, all these instances consist of people living life filled with perceived or real suffering, and choosing to escape it. A few people may oppose with this way of dealing with life. They claim that the truth must be faced - regardless of its nature. Others may claim that each person can make a choice, like choosing between Morpheus' red and blue pills. To make this choice, however, complete knowledge is essential. Rationalists are people who believe in human senses - they believe that the answer to all questions on life can be eventually arrived at. There are quite a few sets of people who do not agree with this chain of thought. Even Plato is said to have believed that what we sense and see is not essentially the reality. For the moment, let's assume that the rationalists are right. Can we still understand the complete laws of nature within the lifetime of humanity as a whole? There are numerous specializations in Science today, and numerous unanswered questions in each of them. Is the query " why are women more/less prone to texting during office hours" (I can be pretty sure that a team of researchers in some part of the World are trying to deduce this) as important as finding a cure to, say, the common cold? If knowledge is power, is more knowledge essentially more power? I would rather say that more essential knowledge is more power. I have nothing against ISRO's satellite launch, and I wish ISRO all the best. But, personally, I would like to see some one prioritize the most important avenues of research, and ensuring that we have the right questions before seeking the answers. This would save a lot of resource and money.